How to signup for a volunteer shift! click VOLUNTEER tab. Then locate Dining & Meal, Free Market, or Pickup Food sign-up areas. Click a shift: Prep Team, Serve & Cleanup Team, Free Market Team, or Unload Food. Thank you for volunteering !! Important: Please Remember your username/password and timeclock in when you arrive for your volunteer shift & Timeclock out when you leave. There are multiple computers available. THANK YOU, this helps Food at First manage 1000+ awesome volunteers. Hint: Use your own smartphone connected to the Food at First WiFi to timeclock in & out. Click either Prep or Serve to see available times. Food at First serves meals every day. FAF also needs market and food pickup volunteers, click other signup links to see all Food at First opportunities. Food at First Free Market is 3 times per week, every Mon Thu & Sat at 611 Clark, Ames, Iowa. 100 to 150 guests, feeding 300 to 400 family members receive groceries at this important FAF activity. FAF also needs kitchen and food pickup volunteers, click other signup links to see all Food at First opportunities. Volunteers pick up & unload (glean) food from establishments. Also, volunteers are needed in the kitchen and market, click other signup links to see all Food at First opportunities. Please remember your username and password. When you arrive and leave your shift please timeclock in/out using a Food at First computer, or use your own smartphone if connected to Food at First WiFi. This helps Food at First a lot. 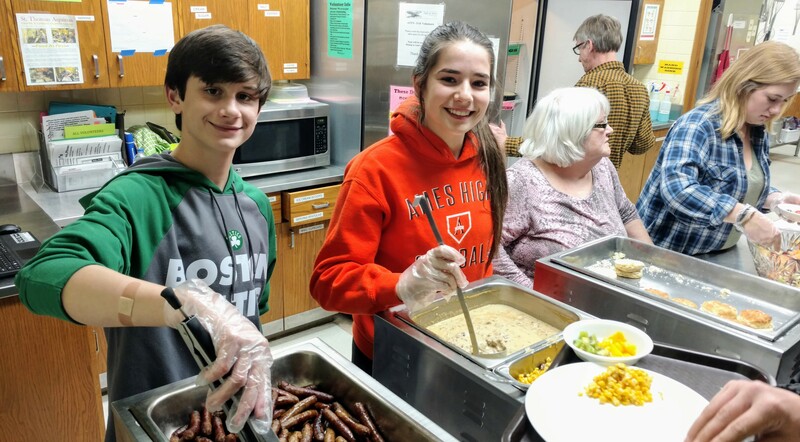 The Food At First program (in Ames, Iowa) currently consists of two parts: a free meal program, and a perishable food pantry. The free meal program serves seven meals per week and is open to anyone who is hungry, no questions asked. Most are evening meals, and all are served at First Christian Church in downtown Ames. While the name is similar, Food At First is independent of First Christian Church who generously allows us to use their building! Perhaps the most interesting aspect of the program is our source of food: almost everything that we serve would otherwise have been thrown away by local grocery stores and food services, but has been turned into wonderful, tasty meals! Because of that, we have PLENTY of food for anyone who could use a little help. The perishable food pantry takes the thousands of pounds of great food that are left over (AFTER taking what we need for use in the meals), and gives it away to folks who need it. Distribution happens at what we call our “Free Market”: 611 Clark Ave (First Christian Church). Because the food is perishable, we collect it and give it away at regular distributions – distributions are at 4:45 to 5:30 PM every Monday and Thursday at First Christian Church, and 10:00 to 10:30 on Saturday mornings.